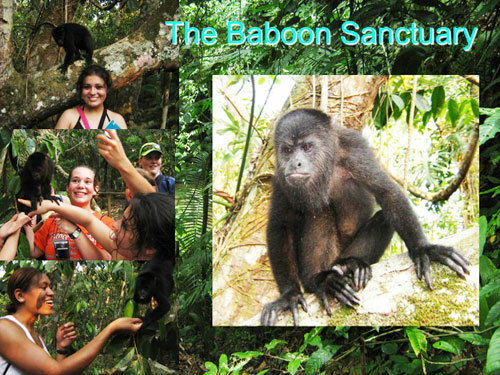 One of the slides from student Claudia Gutarra's PowerPoint presentation on her summer study in Belize. The fall of 2008 is not too soon to think about the summer of 2009. And if you ask some of the Sam Houston State University students who scattered throughout the world this past summer to places like Belize, Thailand and Mexico, the early planning is worth the effort. Biology professor Everett Wilson led the Belize trip. He took 19 students who studied the general field ecology of Belize in Biology 380. His class was full by last September. “They learn a lot and they talk about it for years,” said Wilson. The Belize itinerary included the Lamanai Mayan Ruins, a howler monkey sanctuary, the Belize zoo, the Xunantunich ruins, Goff’s Caye island, the Crooked Tree Wildlife Sanctuary, the Belikin Beer brewery, Caye Caulker coral island, jungles, caves, the Caracol ruins, Blue Hole Park, the Marie Sharp pepper sauce factory and a number of towns and villages. On the other side of the world, Marcus Gillespie, associate professor of geography, was leading a group of 14 students in Thailand. Also going along and serving as an invaluable resource was Gillespie’s wife, Sunisa, who is from Thailand. In addition to Sunisa helping make travel arrangements for the month-long trip, her family contacts significantly reduced the cost of the trip for the students by allowing them to stay in their homes on six different occasions. The total cost of the trip for 27 days was $2,578, which included airfare, all meals and transportation in the countries. Frieda Koeninger, associate professor of foreign languages, coordinated the Puebla Field School, which was begun in the 1940s and has been Sam Houston State’s most popular study abroad effort. That program traditionally has an enrollment of 40-50 students. Staying with host families is also a valued part of the Mexico program, according to Koeninger. A seemingly simple but valuable exercise for the Puebla students is learning to use local public transportation. 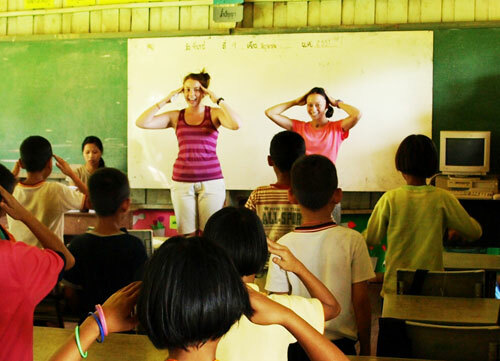 Students Angela Fitchard and Nichole Hahn became teachers in a hill tribe village in Thailand. This year Koeninger took her intermediate Spanish students downtown and showed them her favorite street food. They went to a market and bought fruits and vegetables. They also made out a questionnaire and interviewed people on the street. Business students visited the Volkswagen factory, a company that makes parts for the VW plant, the soft drink company Big Cola, as well as places of cultural importance such as the site of the battle of Cinco de Mayo. Gillespie’s group visited the temple complex of Angkor Wat in Cambodia and such well-known Thai sites as the Temple of the emerald Buddha, Grand Place and Wat Po in Bangkok. They also saw the Sukhothai historic ruins, the king’s summer palace, a hill tribe village, a coastal research center, orchards, orchid farms, and a rainforest. They stayed overnight at an oyster farm located three miles offshore and in Thai houses that are about 100 years old. They swam at the base of a waterfall, rode elephants, went snorkeling, sea kayaking, river kayaking, white water rafting, hiking and caving. They also rode an overnight train on two occasions. Study abroad is just that—unique in its educational value—said Gillespie. 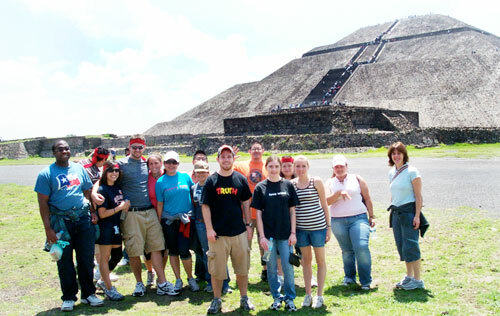 Ruins such as Mexico's Pyramid of the Sun in Teotihuacan were popular stops for study abroad students. Gillespie also likes to emphasize that when U. S. students travel abroad, whether they know it or not, they are scrutinized by those they visit, and should make their best efforts to be good ambassadors. One of the highlights of this year’s trip was when students Nichole Hahn and Angela Fitchard went into a classroom in a hill tribe village. Keelie Hughes went to Puebla to study Spanish, and came home with wonderful memories as well. Hughes likes to remember the last weekend of her trip, to the small rainforest city of Cuetzalan. Not only did she and friends visit caverns and a waterfall, but rappelled off the waterfall. She also learned that professors sometimes have good reasons for making dumb assignments, like having students keep a diary. "At the time this was very annoying," said Hughes, "but now it is great to reflect on what I had written and also be able to put pictures to the different events. I'm glad for that assignment." Overall, Hughes gives the study abroad program a big thumbs up.